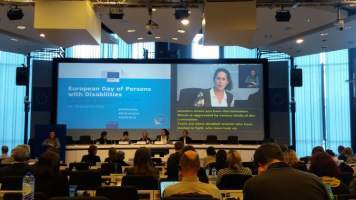 Ángel Bonafé Osca, Director of the Valencian Institute for Social Action and María Sorzano Castellón, European Project Manager represented AER on 29 and 30 November at the European Day of Persons with Disabilities 2016 organised by the European Disability Forum and the European Commission in Brussels. UN Convention on the rights of persons with disabilities: 10 years! Speakers insisted on the importance of the transition from a medical model to a human rights model of disability. A new approach to disability policy making is needed. They were critical about the European Pillar of Social Rights as it has not taken into account the human rights of persons with disabilities vision and does not refer to 2030 Agenda for Sustainable Development. 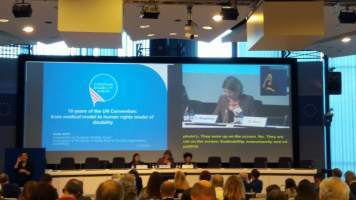 The UN Convention should be used as an instrument to mainstream the rights of persons with disabilities into other European directives. It is, therefore, necessary for EU legislation to be harmonised with the UN Convention. One of the current challenges is to include the UN Convention perspective in the 2030 Agenda for Sustainable Development. They also insisted the legal nature of the European Pillar of Social Rights should be specified and include the rights of women and children with disabilities in it. Expanding the reach of European Pillar of Social Rights needs furthermore to be expanded beyond the eurozone countries. In the panel on independent living, speakers were particularly critical of the fact that the ESF was used in some countries for “Institutionalization” rather than for improving independent living. For the period 2014-2020, ESF is available to promote deinstitutionalisation and community living. · Increasing female labour-market participation and the equal economic independence of women and men. · Reducing the gender pay, earnings, and pension gaps and thus fighting poverty among women. · Promoting equality between women and men in decision-making. · Combating gender-based violence and protecting and supporting victims. · Promoting gender equality and women’s rights across the world. This year the Annual Access City Award was presented by the Commissioner for Employment, Social Affairs, Skills and Labour Mobility, Marianne Thyssen together with European Disability Forum President Yannis Vardakastanis, Belgian Actor Pascal Duquenne and Beatrice Vio, Italian Olympic Athlete. The winner was the City of Chester (UK). The 2nd prize was the City of Rotterdam (NL) and the 3rd prize went to Jurmala (Latvia). – Smart Cities to Lugo, Spain. – Continued Commitment to Accessibility in difficult geographic circumstances to Funchal, Portugal. – Continued Commitment to Accessibility in challenging times to Alessandria, Italy. 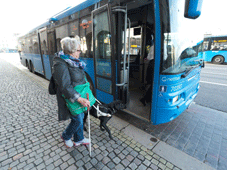 – Accessible work environments to Skellefteå, Sweden.